If you or someone you know loves building things in minecraft, persuade them to take a break, rest those weary eyes by giving them the perfect minecraft gift – this officially licensed Minecraft Mug. 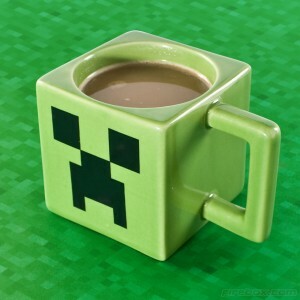 After all that hard mining work this is the perfect vessel to sip your tea and wait for the rush of creepers. This minecraft gift mug is dishwasher safe and features the classic Creeper face logo. It’s definitely a cool piece of Minecraft merchandise, perfect for any fan. Measures approximately 14cm (W) x 9cm (D) x 9cm (H).